While cutting on high hardness or problem material of steel, or deep hole drilling results in difficult scrap discharging, cutter would probably be damaged. In such cases, this device would temporarily stop feeding until resistance is reduced or scrap is gradually discharged, cutter could regain feeding again till this hole is perforated. This device could protect cutter from being broken or damaged in such cases. After perforating, even auto-feeding motion is lasting to the end of stroke (operator forgets to lock fixing bolt), under the function of this device both gang gear tube and machine body won't be damaged. 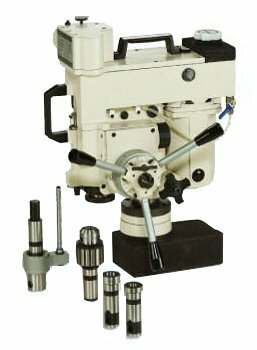 Drill sleeves, borer holder and tapper set are all rapid adaptor design, convenient for replacement of cutters and increasing efficiency.